A big new release in 2012, Gratorama is an innovative online scratch card room developed by NetoPlay, which is also the software that supports Scratchmania. Offering attractive games through an original and playful site, Gratorama will also please you with its promotions and bonuses, which are ideal for new players. We invite you to learn more about this operator through our detailed review below. 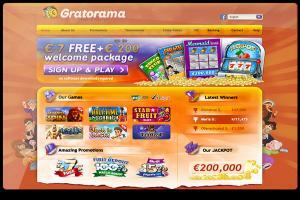 Gratorama is an online scratch card room which offers just fewer than 45 amusements developed by NetoPlay. As this publisher also works with Scratchmania, you will find the same games as on that site. While it is evident that Gratorama primarily offers virtual scratch games such as Safe Cracker, Goal Scorer, and Laugh Slot, the operator also makes available to its users casino games like slot machines and Roulette. A major novelty on Gratorama: the skill games! Indeed, users can have fun playing darts and target-shooting on this site! The Gratorama platform not only provides amusements that have the distinction of being sophisticated and fair – indeed they operate on the basis of a random number generator – but apart from that it is fully secure thanks to 128-bit SSL encryption technology. Thus, on Gratorama the players' personal information and bank data are kept confidential. Like its rivals, Gratorama offers all its players a no-deposit bonus. This has a not-insignificant value of €7 and can be unlocked instantly. But those players who make deposits clearly are better rewarded on Gratorama: indeed, the latter can win a bonus of 100% on their first deposit! As for the remaining promotions, one will find a 15% discount with the use of payment options Skrill and PaySafeCard, exclusive weekly bonuses, as well as comp points redeemable for cash money and prizes. Gratorama invites its members to process their deposits and withdrawals in any of three currencies, the euro, the pound sterling and the U.S. dollar. They may also rely on a dozen transfer solutions to deposit their funds in complete security. Among the options offered on Gratorama will be found a number of credit and debit cards (VISA, MasterCard, Diners Club), regional payment methods available to Italian, Danish and Irish bettors, as well as recognized e-wallets like Skrill.